3.8 will not allow Item Flow on IBD SysML, what am I doing wrong? Also relatively new to SysML. I have a BDD which represents a Control System, my equivalent IBD for that System has two main sub-systems with internal parts. I am able to link ports using Information Flows, see attached diagram. However I am not able to link ports with Item Flows (i.e. solid lines). What do I need to do to achieve an item flow? Am I incorrectly defining the type of port at each end of my connection? In fact UML defines two kind of layout for InformationFlow elements. The first one is the one you used and the second one is the "Realized Information Flow" which can only be used on top of existing link as Association or Connectors in your case. 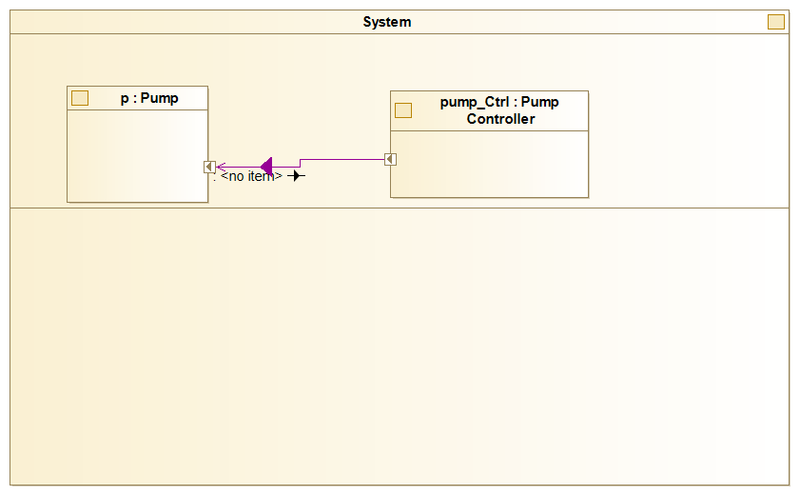 SysML Item Flow extends "UML Realised Information Flow" so you have to first create a connector between your ports. and then add a SysML item Flow on top of it.